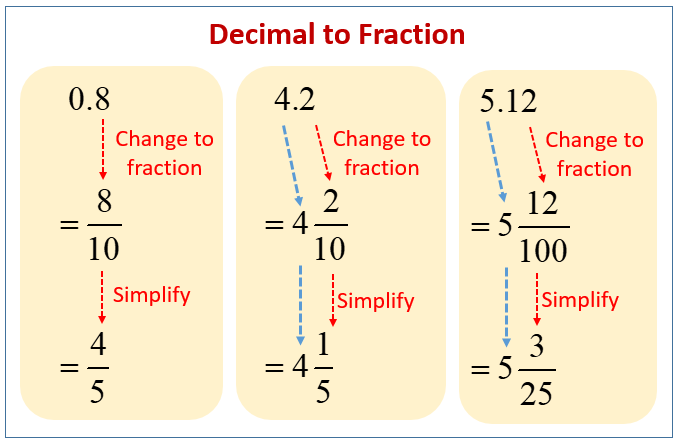 The following diagram gives some examples of converting decimals to fractions. Scroll down the page for more examples and solutions. Step 1 : For the numerator, write all the digits in the decimal number without the decimal point. Step 2 : The denominator is a multiple of 10. The number of zeros is the number of decimal places on the right of the decimal point. Step 3 : Simplify the fraction to the lowest terms whenever possible. Convert 0.6 and 0.09 to fractions. Digits on the right of the decimal point form the numerator of the fraction. Digits on the left of the decimal point form the whole number of the mixed number. How to change any decimal value into its fraction equivalent in lowest terms? It also reviews decimal place values in the process and how to reduce to lowest terms. Here's an example of how we convert a decimal to a simplified fraction. Write 2.75 as a simplified fraction.